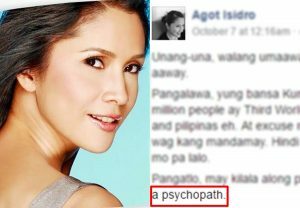 A refresher from Agot Isidro: “Unang-una, walang umaaway sa iyo. As a matter of fact, ikaw ang nang-aaway. Pangalawa, yung bansa Kung saan ka inuluklok ng 16 million out of 100+ million people ay Third World. Kung makapagsalita ka parang superpower and pilipinas eh. At excuse me, ayaw namin magutom. Mag-isa ka na Lang. wag kang mandamay. Hindi na nga nakakain ang nakararami, gugutumin mo pa lalo,” she wrote. HOUSE dilemma: No competent lawyers as prosecutors. RUDY FARINAS can’t be field general and prosecutor at the same time unless a good DAP is on the table. WASHINGTON SYCIP dies at 96 while on a plane enroute to New York. CJ Sereno is thankful to being impeached. She has lost weight lately. Rody said the LP and the communist rebels were reuniting to remove him from the presidency. Ninoy Aquino-Dante Buscayno sequel? MARTIAL LAW IN SEPTEMBER 21, 2019. Rody as Taxman: He collected P40B from Mighty and P6B from Lucio Tan. Prieto/SUNVAR has yet to disclose how much it paid to Rody. Atty Mans Carpio is the happiest broker in town.